KF Refuge is the result of a human adventure, that of Karim Traoré, young Ivorian designer of 28 years old. 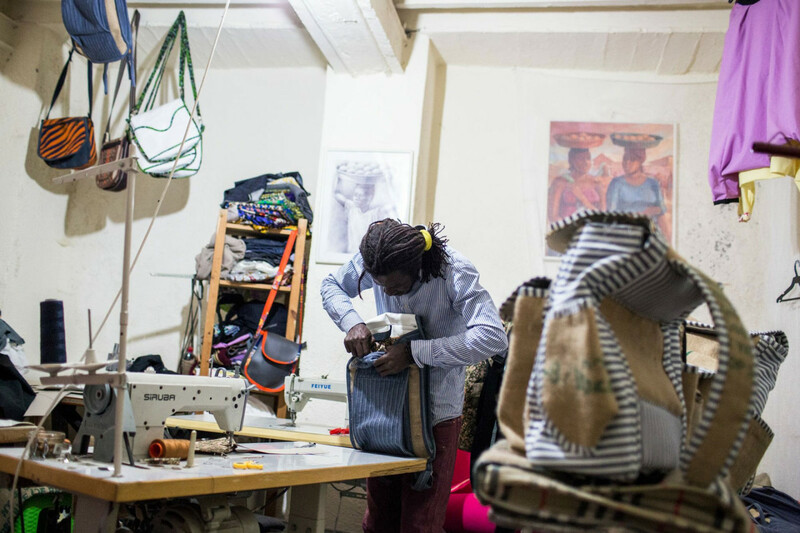 While living in a refugee camp in Tunisia, he had the idea of making bags from recycled materials. Today, in his workshop in Tunis, he continues his work while promoting integration and recycling. It is in full post-election crisis that Karim Traoré leaves his native Ivory Coast to reach Libya in 2011. But the instability of the country, facing a civil war, forced him to join the Choucha refugee camp, southeast of Tunisia. There, in the desert, he decides to start a small sewing shop to spend his days. Tarpaulins that cover the tents offer him an interesting raw material for making bags. A total of 300 refugees participate in these workshops. After the camp closed in 2013, Karim Traoré joins the city of Tunis to try to settle. Gradually, he builds relationships with Tunisian civil society and founded the collective KF Refuge to continue his project of recycled bags. 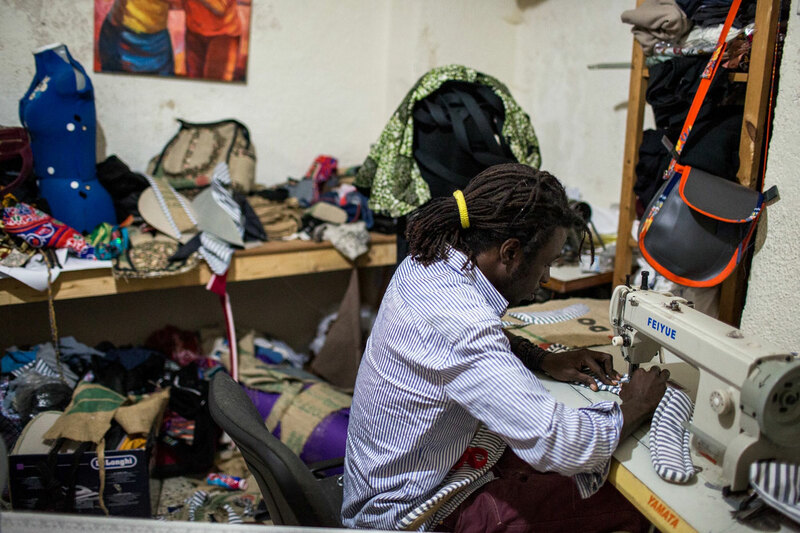 With the support of several organizations, he created a small workshop-boutique furnished with used furniture and sewing materials recovered from textile factories. All creations of KF Refuge are made from recycled materials, mainly with bags of coffee in burlap. Other materials (denim, polyester, etc.) stem from scraps of fabric textile mills. Beyond a necessity, the use of recycled materials responds to a genuine conviction. Thus, the desire to raise awareness of the issue of recycling is at the heart of the proposed KF Refuge. The action of KF Refuge is also based on the integration of immigrants in the economic development of the host country. 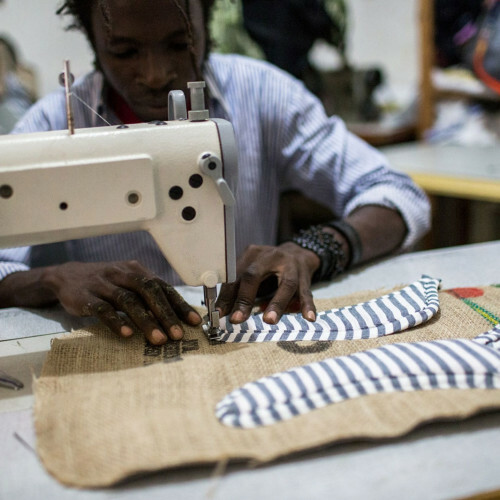 Through this initiative, Karim Traoré wants to encourage refugees to showcase their skills, but also fight prejudice and racism of which they have been sometimes victims. Thus, the project aims to create jobs for both immigrants and Tunisians, to promote solidarity and togetherness. KF Refuge collective currently consists of 6 members. Two people are employed, while the designers are paid by the piece. The increase in orders is expected to increase its workforce shortly. Eventually, Karim Traoré hopes to set up a genuine social solidarity structure by opening workshops in other regions of Tunisia.